Keep your dog’s digestive tract healthy with RITEZYME Canine Digestive Support! Doctors and scientists know that enzymes are more than just a part of the diet of every animal, they play a critical part. The growth of healthy tissue, muscle, bone and organs is made possible by the presence and activity of enyzmes in every cell. 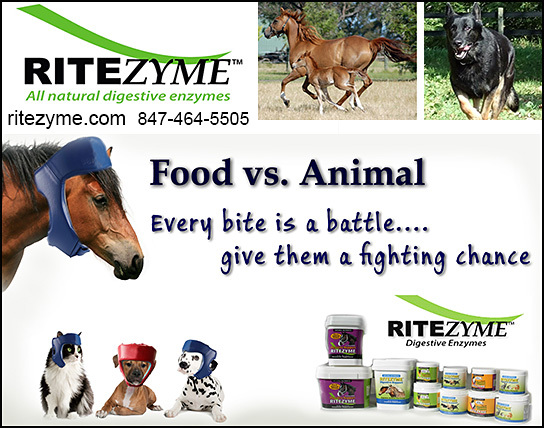 Enzymes help metabolize the food your animal eats, so that each cell can absorb the nutrients that it needs. Without enzymes proper nutrition does not happen! A lack of enzymes can be the cause of indigestion, lack of energy, a dull coat of hair, gas, bloating or constipation. We believe that even healthy animals don't get enough of the enzymes they really need. Animals are born with a fixed amount of enzymes, and if they use their natural born supply of enzymes too soon, it would lead to shortage of enzymes in their senior years. That's why we've created RITEZYME Digestive Support for your four legged companions. The RITEZYME family of enzymatic supplements aid in the digestion of food, improving the absorption of essential nutrients. An animal that gets proper nutrition is a healthier animal. Made with ingredients derived from Mother Nature, RITEZYME Digestive Support can improve the health and happiness of your favorite horse, dog or cat. RITEZYME Canine Digestive Support RITEZYME is specially formulated to provide the right combination of enzymes to replace what is missing in the diet of many dogs. Our proprietary formulas contain the right ingredients in the right proportion to support your animal’s digestive processes. No sugars, all natural ingredients. RITEZYME comes into two formulas to match the lifestyle and needs of your dog. • RITEZYME Canine Digestive Support contains a proprietary enzyme blend of Amylase, Lipase, Bromelain, Protease and Cellulase. • Canine Active Formula contains a proprietary enzyme blend of Pancreatin 4X, Protease AO, Bromelain, Papain, Lipase, Hemicellulase and Cellulase. Three convenient sizes, 100 grams, 300 grams, and 454 grams. What Are The Signs That My Dog Is Not Getting The Enzymes or Nutrients They Need? Why Are Plant-Based Enzymes Better For My Pet Than Animal-Based Enzymes? Plant-based enzymes have the capacity to be effective in a wider pH range and therefore will work better in most cases, no matter what the type of diet or metabolic system. Can I Use Hot Water or Broth With RITEZYME Over Feed For My Dog or Cat? No. Please do not add HOT water to your animal's food because it will denature the enzymes. However, adding lukewarm water will excite the molecules and make them readily available for immediate consumption. Does RITEZYME Interfere With Other Supplements or Medications? No. RITEZYME will not interfere with any other nutrients or medications. In fact, RITEZYME will help improve nutrient absorption even from the vitamins given and is a total complement to all other nutrient sources! I'm a retired Police Officer who worked in the Western Suburbs of Chicago. I had the privilege of being a canine handler for seven and a half years. During that time, I always fed my canine partner a premium dog food and had pretty good results, that is until a larger organization would come in and buy the company. In both cases, it seemed that the food quality would go down noticeably. I'm now adding RITEZYME to my dog's food to get the most nutrition I can out of the food. Our canine partners never seem to be around for as long as we would like. That's why I'm trying to increase the odds with good nutrition and adding RITEZYME to my dog's meals. Lucky was losing hair and scratching himself all the time from skin irritations. For a month now, I have started adding RITEZYME to his food and have noticed that his fur is now starting to grow back in the bald spots. He is not scratching as much, his skin is looking healthy pink and he is a lot more playful. AWESOME RITEZYME! Order RITEZYME Canine Digestive Support for Your Dog Today! Your dog deserves to have the best health possible. RITEZYME can give him or her that added support! Please call us today or find us also at Amazon.com!